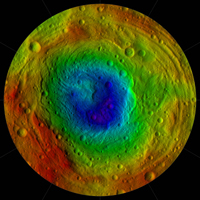 These color-shaded relief maps show the northern and southern hemispheres of Vesta, derived from images analysis. 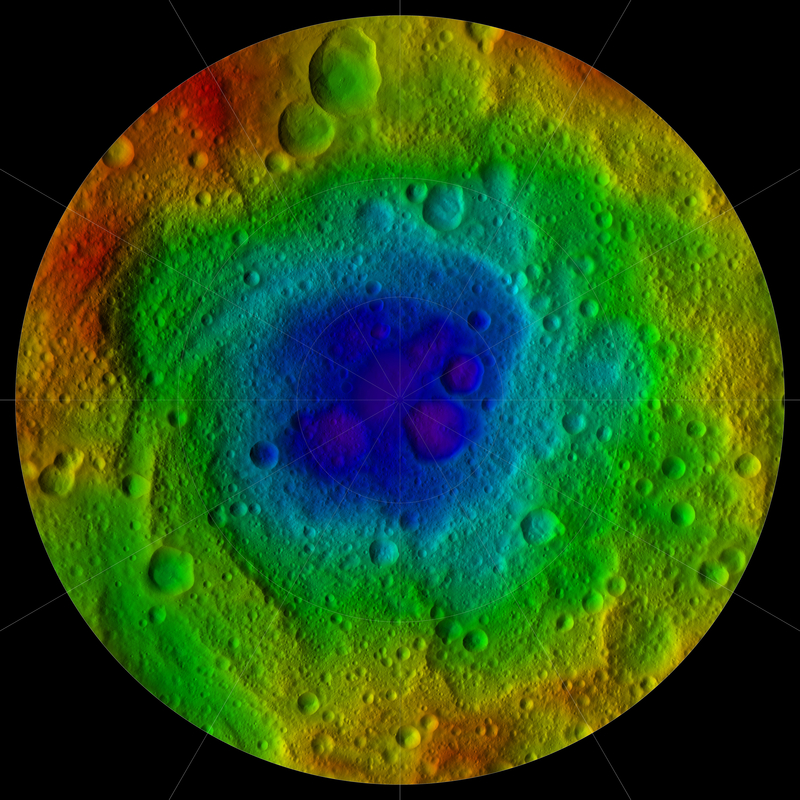 Colors represent distance relative to Vesta's center, with lows in violet and highs in red. In the northern hemisphere map on the left (Figure 1), the surface ranges from lows of minus 13.82 miles (22.24 kilometers) to highs of 27.48 miles (44.22 kilometers). Light reflected off the walls of some shadowed craters at the north pole (in the center of the image) was used to determine the height. In the southern hemisphere map on the right (Figure 2), the surface ranges from lows of minus 23.65 miles (38.06 kilometers) to 26.61 miles (42.82 kilometers). The shape model was constructed using images from Dawn's framing camera that were obtained from July 17, 2011, to Aug. 26, 2012. The data have been stereographically projected on a 300-mile-diameter (500-kilometer-diameter) sphere with the poles at the center. The three craters that make up Dawn's "snowman" feature can be seen at the top of the northern hemisphere map on the left. 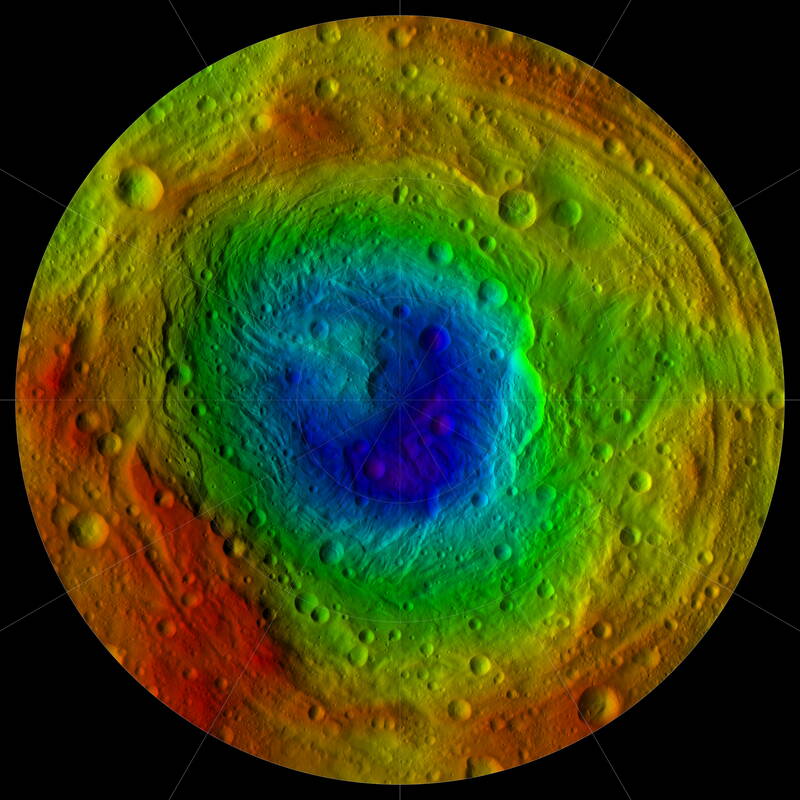 A mountain more than twice the height of Mount Everest, inside the largest impact basin on Vesta, can be seen near the center of the southern hemisphere map on the right. These images are the last in Dawn's Image of the Day series during the cruise to Dawn's second destination, Ceres. A full set of Dawn data is being archived at http://pds.nasa.gov/. The Dawn mission to Vesta and Ceres is managed by NASA's Jet Propulsion Laboratory, a division of the California Institute of Technology in Pasadena, for NASA's Science Mission Directorate, Washington D.C. UCLA is responsible for overall Dawn mission science. The Dawn framing cameras were developed and built under the leadership of the Max Planck Institute for Solar System Research, Katlenburg-Lindau, Germany, with significant contributions by DLR German Aerospace Center, Institute of Planetary Research, Berlin, and in coordination with the Institute of Computer and Communication Network Engineering, Braunschweig. The Framing Camera project is funded by the Max Planck Society, DLR, and NASA/JPL.